Mash the garlic into a paste with the salt using a mortar and pestle or the flat side of a chef's knife on your cutting board. Mix the garlic into the lamb along with the onion, parsley, coriander, cumin, cinnamon, allspice, cayenne pepper, ginger, and pepper in a mixing bowl until well blended. Form the mixture into 28 balls. Place the meatballs onto a baking sheet. Place in meatball in a preheated 375 F oven, on the middle rack for about 20 minutes or until the meatballs are no longer pink in the middle. 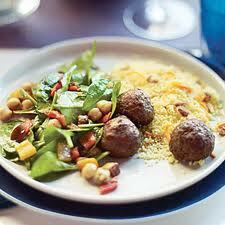 These lamb meatballs are great with hummus and a green salad and is good served with quinoa, rice or roasted potatoes.